This time it’s fun with science watching graphene turn into buckyballs. PhysOrg has an article covering this video with additional images. Peering through a transmission electron microscope (TEM), researchers from Germany, Spain, and the UK have observed graphene sheets transforming into spherical fullerenes, better known as buckyballs, for the first time. The experiment could shed light on the process of how fullerenes are formed, which has so far remained mysterious on the atomic scale. Via KurzweilAI.net — For all those fresh graduates out there, one word — graphene. A method of drawing nanoscale circuits onto atom-thick sheets of graphene has been developed by researchers at the U.S. Naval Research Laboratory, Georgia Institute ofTechnology, and the University of Illinois at Urbana-Champaign. The simple, quick one-step process for creating nanowires, based on thermochemical nanolithography (TCNL), tunes the electronic properties of reduced graphene oxide, allowing it to switch from being an insulating material to a conducting material. Scientists who work with nanocircuits are enthusiastic about graphene because electrons meet with less resistance when they travel along graphene compared to silicon and because today’s silicon transistors are nearly as small as allowed by the laws of physics. Graphene also has the edge due to its thickness – it’s a carbon sheet that is a single atom thick. However, no one knew how to produce graphene nanostructures with such a reproducible or scalable method until now. … just got a little bit easier. This is good news out of Rice University. I written this many times, but there’s simply too much smoke in the graphene hype for there not to be a serious fire somewhere. I’m guessing some combination of display technology for handheld electronics is one of the best areas to monitor for market-ready graphene applications. Single-atom-thick sheets of carbon called graphene have some amazing properties: graphene is strong, highly electrically conductive, flexible, and transparent. This makes it a promising material to make flexible touch screens and superstrong structural materials. But creating these thin carbon sheets, and then building things out of them, is difficult to do outside the lab. Now an advance in making and processing graphene in solution may make it practical to work with the material at manufacturing scale. Researchers at Rice University have made graphene solutions 10 times more concentrated than any before. They’ve used these solutions to make transparent, conductive sheets similar to the electrodes on displays, and they’re currently developing methods for spinning the graphene solutions to generate fibers and structural materials for airplanes and other vehicles that promise to be less expensive than today’s carbon fiber. Making material: Sheets of graphene lay atop a mat of single-walled carbon nanotubes. Nanoelectronics is a major — and important — field right now, and graphene and its cousin graphane are very important materials research components. Both of the nanomaterials are getting a lot of hype, particularly graphene, but there’s far too much smoke for there not to be at least a little fire. It’s exciting to keep watch on the news to see the breakthroughs as they happen, and eventually cover real-world, market-ready uses for graphene and graphane. Graphane is the material of choice for physicists on the cutting edge of materials science, and Rice University researchers are right there with the pack – and perhaps a little ahead. The theoretical work by Abhishek Singh and Evgeni Penev, both postdoctoral researchers in co-author Yakobson’s group, was published online last week in the journal ACS Nano and will be on the cover of the print version in June. Rice was recently named the world’s No. 1 institution for materials science research by a United Kingdom publication. Graphene has become the Flat Stanley of materials. The one-atom-thick, honeycomb-like form of carbon may be two-dimensional, but it seems to be everywhere, touted as a solution to stepping beyond the limits of Moore’s Law. Graphane is simply graphene modified by hydrogen atoms added to both sides of the matrix, which makes it an insulator. While it’s still technically only a single atom thick, graphane offers great possibilities for the manipulation of the material’s semiconducting properties. “Their work is actually supporting what we’re suggesting, that you can do this patterning in a controlled way,” Penev said. Funding from the Office of Naval Research supported the work. Computations were performed at the Department of Defense Supercomputing Resource Center at the Air Force Research Laboratory. Nanotech news from UC Riverside. IMAGE: Alexander Balandin is a professor of electrical engineering in the Bourns College of Engineering at the University of California, Riverside. Professor Alexander Balandin and a team of UC Riverside researchers, including Chun Ning Lau, an associate professor of physics, have taken another step toward new technology that could keep laptops and other electronic devices from overheating. Balandin, a professor of electrical engineering in the Bourns College of Engineering, experimentally showed in 2008 that graphene, a recently discovered single-atom-thick carbon crystal, is a strong heat conductor. The problem for practical applications was that it is difficult to produce large, high quality single atomic layers of the material. Now, in a paper published in Nature Materials, Balandin and co-workers found that multiple layers of graphene, which are easier to make, retain the strong heat conducting properties. That’s also a significant discovery in fundamental physics. Balandin’s group, in addition to measurements, explained theoretically how the materials’ ability to conduct heat evolves when one goes from conventional three-dimensional bulk materials to two-dimensional atomically-thin films, such as graphene. The results published in Nature Materials may have important practical applications in removal of dissipated hear from electronic devices. Heat is an unavoidable by-product when operating electronic devices. Electronic circuits contain many sources of heat, including millions of transistors and interconnecting wiring. In the past, bigger and bigger fans have been used to keep computer chips cool, which improved performance and extended their life span. However, as computers have become faster and gadgets have gotten smaller and more portable the big-fan solution no longer works. New approaches to managing heat in electronics include incorporating materials with superior thermal properties, such as graphene, into silicon computer chips. In addition, proposed three-dimension electronics, which use vertical integration of computer chips, would depend on heat removal even more, Balandin said. Silicon, the most common electronic material, has good electronic properties but not so good thermal properties, particularly when structured at the nanometer scale, Balandin said. As Balandin’s research shows, graphene has excellent thermal properties in addition to unique electronic characteristics. Graphene is not a replacement for silicon, but, instead could be used in conjunction with silicon, Balandin said. At this point, there is no reliable way to synthesize large quantities of graphene. However, progress is being made and it could be possible in a year or two, Balandin said. Initially, graphene would likely be used in some niche applications such as thermal interface materials for chip packaging or transparent electrodes in photovoltaic solar cells, Balandin said. But, in five years, he said, it could be used with silicon in computer chips, for example as interconnect wiring or heat spreaders. It may also find applications in ultra-fast transistors for radio frequency communications. Low-noise graphene transistors have already been demonstrated in Balandin’s lab. Balandin published the Nature Materials paper with two of his graduate students Suchismita Ghosh, who is now at Intel Corporation, and Samia Subrina, Lau. one of her graduate students, Wenzhong Bao, and Denis L. Nika and Evghenii P. Pokatilov, visting researchers in Balandin’s lab who are based at the State University of Moldova. The University of California, Riverside (www.ucr.edu) is a doctoral research university, a living laboratory for groundbreaking exploration of issues critical to Inland Southern California, the state and communities around the world. Reflecting California’s diverse culture, UCR’s enrollment of over 19,000 is expected to grow to 21,000 students by 2020. The campus is planning a medical school and has reached the heart of the Coachella Valley by way of the UCR Palm Desert Graduate Center. The campus has an annual statewide economic impact of more than $1 billion. Caption: Moiré patterns appear when two or more periodic grids are overlaid slightly askew, which creates a new larger periodic pattern. 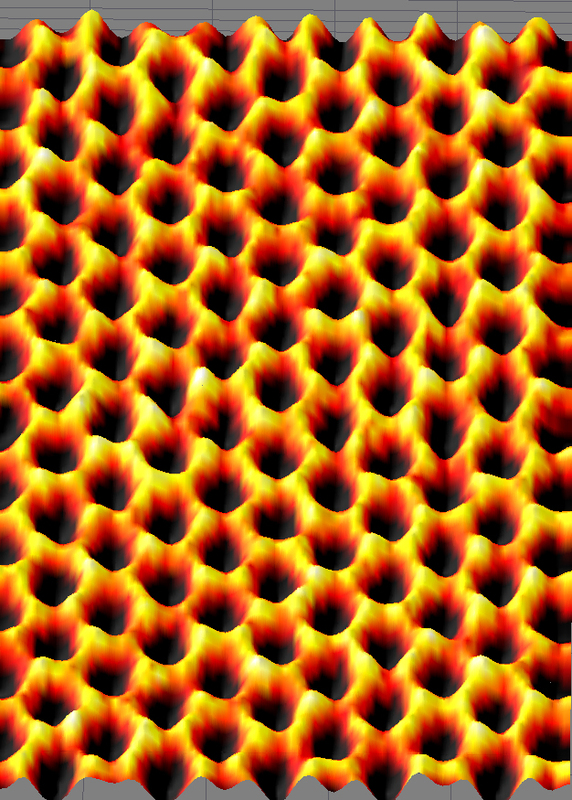 Researchers from NIST and Georgia Tech imaged and interpreted the moiré patterns created by overlaid sheets of graphene to determine how the lattices of the individual sheets were stacked in relation to one another and to find subtle strains in the regions of bulges or wrinkles in the sheets. Looks like more so than carbon nanotubes. This attribute is key to using the material in electronic devices such as actuators, valves in labs-on-a-chip and electronic paper. Physicists at UC San Diego and Boston University think so. In a paper published in the journal Physical Review B, the scientists say the propensity of graphene—a single layer of carbon atoms arranged in a honeycomb lattice— to stick to itself and form carbon “nanoscrolls” could be controlled electrostatically to form a myriad of new devices. Unlike carbon nanotubes—cylindrical molecules of pure carbon with novel properties that have become the focus of much of the attention of new application in electronics and materials development—carbon nanoscrolls retain open edges and have no caps. “As a result, nanoscrolls can change their shape and their inner and outer diameters, while nanotubes cannot,” said Michael Fogler, an associate professor of physics at UCSD and the first author of the paper. News from Physikalisch-Technische Bundesanstalt on plasmonics in graphene. This release is available in German. IMAGE: A residual interaction with the SiC substrate causes the formation of the six-fold satellite reflex structure. At present, graphene probably is the most investigated new material system worldwide. Due to its astonishing mechanical, chemical and electronic properties, it promises manifold future applications – for example in microelectronics. The electrons in graphene are particularly movable and could, therefore, replace silicon which is used today as the basic material of fast computer chips. In a research cooperation, scientists of Leibniz University Hanover and of the Physikalisch-Technische Bundesanstalt (PTB) have now investigated in which way a rough base affects the electronic properties of the graphene layer. Their results suggest that it will soon be possible to control plasmons, i.e. collective oscillations of electrons, purposefully in the graphene, by virtually establishing a lane composed of projections and humps for them. The results were published in the current edition of the New Journal of Physics. The structure of graphene itself is fascinating: It consists of exactly one single, regular layer of carbon atoms. To manufacture this incredibly thin layer absolutely neatly is a great challenge. A possible method to recipitate graphene extensively on an insulating substrate is epitaxy, i.e. the controlled growth of graphene on insulating silicon carbide. For this purpose, a silicon carbide crystal is heated in vacuum. Starting from a specific temperature, carbon atoms migrate to the surface and form a monoatomic layer on the – still solid – silicon carbide. An important question for later applications is, how defects and steps of the silicon carbide surface affect the electronic properties of the graphene grown on it. Within the scope of a research cooperation between PTB and Leibniz University Hanover, the influence of defects in the graphene on the electronic properties has been investigated. During the investigations, special attention was paid to the influence of the defects on a special electronic excitation, the so-called plasmons. By different sample preparation, first of all silicon carbide crystals with different surface roughness and, thus, with a different concentration of surface defects were investigated, on which, subsequently, graphene formed. The influence of the defects on the plasmon excitations was then investigated by means of low-energy electron diffraction (SPA-LEED) and electron loss spectroscopy (EELS). The process revealed a strong dependence of the lifetime of plasmon on the surface quality. Defects, as they are caused on step edges and grain boundaries, strongly impede the propagation of the plasmons and drastically shorten their lifetime. Here it is remarkable that the other electronic properties of the plasmons, in particular their dispersion, remain largely unaffected. This opens up interesting possibilities for the future technical application and use of plasmons (the so-called “plasmonics”) in graphene. By selective adjustment of the surface roughness, different graphene ranges could be generated in which the plasmons are either strongly dampened or can propagate almost unobstructedly. In this way, the plasmons could be conducted along “plasmon conductors” with low surface roughness specifically from one point of a graphene chip to another. “Plasmon damping below the Landau regime: the role of defects in epitaxial graphene”. New Journal of Physics 12, 033017 (2010). A graphene two-fer this evening. This news is another important finding toward commercializing graphene. CHESTNUT HILL, MA (4/8/2010) – The single-atom thick material graphene maintains its high thermal conductivity when supported by a substrate, a critical step to advancing the material from a laboratory phenomenon to a useful component in a range of nano-electronic devices, researchers report in the April 9 issue of the journal Science. The team of engineers and theoretical physicists from the University of Texas at Austin, Boston College, and France’s Commission for Atomic Energy report the super-thin sheet of carbon atoms – taken from the three-dimensional material graphite – can transfer heat more than twice as efficiently as copper thin films and more than 50 times better than thin films of silicon. Since its discovery in 2004, graphene has been viewed as a promising new electronic material because it offers superior electron mobility, mechanical strength and thermal conductivity. These characteristics are crucial as electronic devices become smaller and smaller, presenting engineers with a fundamental problem of keeping the devices cool enough to operate efficiently. The research advances the understanding of graphene as a promising candidate to draw heat away from “hot spots” that form in the tight knit spaces of devices built at the micro and nano scales. From a theoretical standpoint, the team also developed a new view of how heat flows in graphene. When suspended, graphene has extremely high thermal conductivity of 3,000 to 5,000 watts per meter per Kelvin. But for practical applications, the chicken-wire like graphene lattice would be attached to a substrate. The team found supported graphene still has thermal conductivity as high as 600 watts per meter per Kelvin near room temperature. That far exceeds the thermal conductivities of copper, approximately 250 watts, and silicon, only 10 watts, thin films currently used in electronic devices. The loss in heat transfer is the result of graphene’s interaction with the substrate, which interferes with the vibrational waves of graphene atoms as they bump against the adjacent substrate, according to co-author David Broido, a Boston College Professor of Physics. The conclusion was drawn with the help of earlier theoretical models about heat transfer within suspended graphene, Broido said. Working with former BC graduate student Lucas Lindsay, now an instructor at Christopher Newport University, and Natalio Mingo of France’s Commission for Atomic Energy, Broido re-examined the theoretical model devised to explain the performance of suspended graphene. In addition to its superior strength, electron mobility and thermal conductivity, graphene is compatible with thin film silicon transistor devices, a crucial characteristic if the material is to be used in low-cost, mass production. Graphene nano-electronic devices have the potential to consume less energy, run cooler and more reliably, and operate faster than the current generation of silicon and copper devices. Broido, Lindsay and Mingo were part of a research team led by Li Shi, a mechanical engineering professor at the University of Texas at Austin, which also included his UT colleagues Jae Hun Seol, Insun Jo, Arden Moore, Zachary Aitken, Michael Petttes, Xueson Li, Zhen Yao, Rui Huang, and Rodney Ruoff. The research was supported by the Thermal Transport Processes Program and the Mechanics of Materials Program of the National Science Foundation, the U.S. Office of Naval Research, and the U.S. Department of Energy Office of Science. This development from the Lawrence Berkeley National Laboratory is a major breakthrough toward commercializing graphene. The link goes to a news release on this development, but it also serves as a very nice quick-hit primer on graphene as a material. Graphene, the two-dimensional crystalline form of carbon, is a potential superstar for the electronics industry. With freakishly mobile electrons that can blaze through the material at nearly the speed of light – 100 times faster than electrons can move through silicon – graphene could be used to make superfast transistors or computer memory chips. Graphene’s unique “chicken wire” atomic structure exhibits incredible flexibility and mechanical strength, as well as unusual optical properties that could open a number of promising doors in both the electronics and the photonics industries. However, among the hurdles preventing graphite from joining the pantheon of star high-tech materials, perhaps none looms larger than just learning to make the stuff in high quality and usable quantities. “Before we can fully utilize the superior electronic properties of graphene in devices, we must first develop a method of forming uniform single-layer graphene films on nonconducting substrates on a large scale,” says Yuegang Zhang, a materials scientist with the Lawrence Berkeley National Laboratory (Berkeley Lab). Current fabrication methods based on mechanical cleavage or ultrahigh vacuum annealing, he says, are ill-suited for commercial-scale production. Graphene films made via solution-based deposition and chemical reduction have suffered from poor or uneven quality. Zhang and colleagues at Berkeley Lab’s Molecular Foundry, a U.S. Department of Energy (DOE) center for nanoscience, have taken a significant step at clearing this major hurdle. They have successfully used direct chemical vapor deposition (CVD) to synthesize single-layer films of graphene on a dielectric substrate. Zhang and his colleagues made their graphene films by catalytically decomposing hydrocarbon precursors over thin films of copper that had been pre-deposited on the dielectric substrate. The copper films subsequently dewetted (separated into puddles or droplets) and were evaporated. The final product was a single-layer graphene film on a bare dielectric. “This is exciting news for electronic applications because chemical vapor deposition is a technique already widely used in the semiconductor industry,” Zhang says. Zhang and his colleagues have reported their findings in the journal Nano Letters in a paper titled, “Direct Chemical Vapor Deposition of Graphene on Dielectric Surfaces.” Other co-authors of this paper were Ariel Ismach, Clara Druzgalski, Samuel Penwell, Maxwell Zheng, Ali Javey and Jeffrey Bokor, all with Berkeley Lab. In their study, Zhang and his colleagues used electron-beam evaporation to deposit copper films ranging in thickness from 100 to 450 nanometers. Copper was chosen because as a low carbon solubility metal catalyst it was expected to allow better control over the number of graphene layers produced. Several different dielectric substrates were evaluated including single-crystal quartz, sapphire, fused silica and silicon oxide wafers. CVD of the graphene was carried out at 1,000 degrees Celsius in durations that ranged from 15 minutes up to seven hours. “This was done to allow us to study the effect of film thickness, substrate type and CVD growth time on the graphene formation,” Zhang says. A combination of scanning Raman mapping and spectroscopy, plus scanning electron and atomic force microscopy confirmed the presence of continuous single-layer graphene films coating metal-free areas of dielectric substrate measuring tens of square micrometers. Even the appearance of wrinkles in the graphene films that followed along the lines of the dewetting shape of the copper could prove to be beneficial in the long-run. Although previous studies have indicated that wrinkles in a graphene film have a negative impact on electronic properties by introducing strains that reduce electron mobility, Zhang believes the wrinkles can be turned to an advantage. “If we can learn to control the formation of wrinkles in our films, we should be able to modulate the resulting strain and thereby tailor electronic properties,” he says. This work was primarily supported by the DOE Office of Science. The Molecular Foundry is one of the five DOE Nanoscale Science Research Centers (NSRCs), premier national user facilities for interdisciplinary research at the nanoscale. Together the NSRCs comprise a suite of complementary facilities that provide researchers with state-of-the-art capabilities to fabricate, process, characterize and model nanoscale materials, and constitute the largest infrastructure investment of the National Nanotechnology Initiative. The NSRCs are located at DOE’s Argonne, Brookhaven, Lawrence Berkeley, Oak Ridge and Sandia and Los Alamos National Laboratories. To make a graphene thin film, Berkeley researchers (a) evaporated a thin layer of copper on a dielectric surface; (b) then used CVD to lay down a graphene film over the copper. (c) The copper dewets and evaporates leaving (d) the graphene film directly on the dielectric substrate. Doing some science on the once and future miracle material. I’m not holding my breath, but if graphene manages to reach fifty percent of its hype, it’s going to change the world. It’s that hyped, and it truly has that much promise. In other words, the first graphene layer grown on ruthenium satiates the metal substrate, allowing the rest of the layers to reclaim their normal properties. 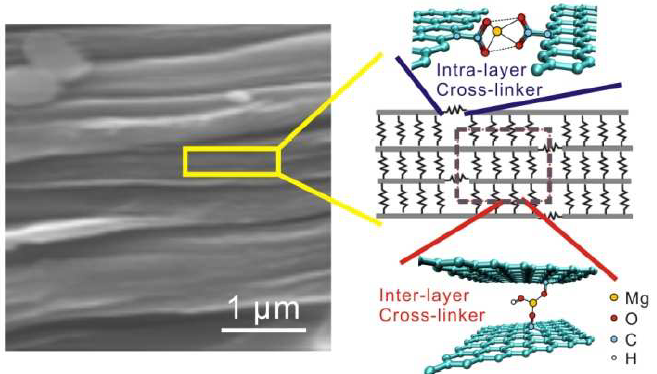 “As a result of this growth process, a two-layer stack acts like an isolated monolayer of graphene and a three-layer stack acts like an isolated bilayer,” Sutter said. The findings of the group, which also includes Brookhaven researchers Mark Hybertsen, Jurek Sadowski, and Eli Sutter, lays groundwork for future graphene production for advanced technologies, and helps researchers understand how metals — for example in device contacts — change the properties of graphene. Needless to say this will have a major impact on using hydrogen as a power source in fuel cells or other applications. Graphene—carbon formed into sheets a single atom thick—now appears to be a promising base material for capturing hydrogen, according to recent research* at the National Institute of Standards and Technology (NIST) and the University of Pennsylvania. The findings suggest stacks of graphene layers could potentially store hydrogen safely for use in fuel cells and other applications. The research is funded in part by the Department of Energy. Commercial production of graphene is coming and we can expect to see some of those “miracle material” claims begin to show fruition. Scientists have leaped over a major hurdle in efforts to begin commercial production of a form of carbon that could rival silicon in its potential for revolutionizing electronics devices ranging from supercomputers to cell phones. Called graphene, the material consists of a layer of graphite 50,000 times thinner than a human hair with unique electronic properties. Their study appears in ACS’ Nano Letters, a monthly journal. Victor Aristov and colleagues indicate that graphene has the potential to replace silicon in high-speed computer processors and other devices. Standing in the way, however, are today’s cumbersome, expensive production methods, which result in poor-quality graphene and are not practical for industrial scale applications. This conductive ink is one of the first products on the market to incorporate graphene, a sheet of carbon just one atom thick. Applying the ink with standard techniques can print wiring for RFID antennas, keypads, and display backplanes directly onto paper or cardboard stock. Unlike metallic conductive inks, the graphene ink does not have to be heated after printing. I’ve done tons of blogging on graphene and this news seems to be direct competition with this graphene news I covered about a week ago. The issue is turning graphene into a semiconductor to allow the material to eventually replace silicon in electronic devices. 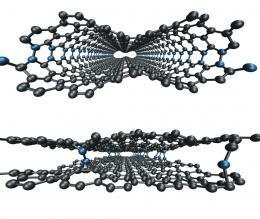 The last link up there goes to a post outlining the concept of using nanoribbons of graphene, the middle link goes to research claiming a “nanomesh” is a superior method of turning the carbon nanomaterial into a semiconductor. Graphene, a one-atom-thick layer of a carbon lattice with a honeycomb structure, has great potential for use in radios, computers, phones and other electronic devices. But applications have been stymied because the semi-metallic graphene, which has a zero band gap, does not function effectively as a semiconductor to amplify or switch electronic signals. While cutting graphene sheets into nanoscale ribbons can open up a larger band gap and improve function, ‘nanoribbon’ devices often have limited driving currents, and practical devices would require the production of dense arrays of ordered nanoribbons — a process that so far has not been achieved or clearly conceptualized. In research to be published in the March issue of Nature Nanotechnology (currently available online), Huang’s team reveals the creation of a new graphene nanostructure called graphene nanomesh, or GNM. The new structure is able to open up a band gap in a large sheet of graphene to create a highly uniform, continuous semiconducting thin film that may be processed using standard planar semiconductor processing methods. “The nanomeshes are prepared by punching a high-density array of nanoscale holes into a single or a few layers of graphene using a self-assembled block copolymer thin film as the mask template,” said Huang. “GNMs can address many of the critical challenges facing graphene, as well as bypass the most challenging assembly problems,” Huang said. “In conjunction with recent advances in the growth of graphene over a large-area substrate, this concept has the potential to enable a uniform, continuous semiconducting nanomesh thin film that can be used to fabricate integrated devices and circuits with desired device size and driving current. “The concept of the GNM therefore points to a clear pathway towards practical application of graphene as a semiconductor material for future electronics. The unique structural and electronic characteristics of the GNMs may also open up exciting opportunities in highly sensitive biosensors and a new generation of spintronics, from magnetic sensing to storage,” she said. The study was funded in part by Huang’s UCLA Henry Samueli School of Engineering and Applied Science Fellowship. The UCLA Henry Samueli School of Engineering and Applied Science, established in 1945, offers 28 academic and professional degree programs, including an interdepartmental graduate degree program in biomedical engineering. Ranked among the top 10 engineering schools at public universities nationwide, the school is home to seven multimillion-dollar interdisciplinary research centers in wireless sensor systems, nanotechnology, nanomanufacturing and nanoelectronics, all funded by federal and private agencies. Fast like already an order of magnitude faster than the quickest silicon transistors. The IBM prototype graphene transistors run at 100 gigahertz. The transistors were created using processes that are compatible with existing semiconductor manufacturing, and experts say they could be scaled up to produce transistors for high-performance imaging, radar, and communications devices within the next few years, and for zippy computer processors in a decade or so. Researchers have previously made graphene transistors using laborious mechanical methods, for example by flaking off sheets of graphene from graphite; the fastest transistors made this way have reached speeds of up to 26 gigahertz. Transistors made using similar methods have not equaled these speeds. Growing transistors on a wafer not only leads to better performance, it’s also more commercially feasible, says Phaedon Avouris, leader of the nanoscale science and technology group at the IBM Watson Research Center in Ossining, NY where the work was carried out. Speedy switches: These arrays of transistors, printed on a silicon carbide wafer, operate at speeds of 100 gigahertz. It’s been a while since I’ve blogged about graphene so I was pleased to read this news at the physics arXiv blog on a method to produce the material at a substantially lower cost. The hype about graphene probably is a bit over-the-top, but it’s proving to be quite the miracle nanomaterial. The world of materials science is aflutter with stories about graphene, a supermaterial that is capable of almost anything (if you believe the hype). This form of carbon chickenwire, they tell us, is stronger, faster and better than almost any other material you care to name. But not cheaper. At least not yet. The big problem with graphene is making it. The only way to get it is to chip away at a bigger block of graphite and then hunt through the flakes looking for single layers of the stuff. That’s not a technique that’s going to revolutionise the electronics industry, regardless of how much cheap labour is available in China. That’s why an announcement from Hirokazu Fukidome at Tohoku University in Japan and a few buddies is hugely important. These guys say they have found a way to grow graphene on a silicon substrate. To show off their technique they’ve combined it with conventional lithography to create a graphene-on-silicon field effect transistor–just the kind of device the electronics industry wants to build by the billion. That’s a big deal for two reasons. First, being able to grow graphene from scratch is going to be a huge boost to the study of this stuff and its myriad amazing properties. Second, being able to grow it on silicon makes it compatible (in principle at least) with the vast silicon-based fabrication industry as it stands.